Driver and General Union - What's New? Check back here regularly to find out what's going on at D&G Union. This might be the time of year when you are thinking about pay rises or budgeting for the coming year and, for the second year in succession, there are significant statutory increases in the pipeline. In this regard you need to be aware of two changes, being an increase in the National Living Wage (NLW) and National Minimum Wage (NMW), and an increase in pension contributions. As you can see, the increase is quite a bit above the rate of inflation. Indeed, last year’s increase in the “adult rate” was also way above inflation at 4.4%. Under pensions auto-enrolment the minimum total pension contribution is currently 5% of which the employer must pay at least 2%. Most often the employer does pay the minimum of 2%, leaving the employee to pay the 3% balance. From 6 April 2019 the minimum total contribution increases to 8% with the employer paying a minimum of 3%, leaving the employee to pay 5%. One of Starlights Cheerleading coach/athletes has been diagnosed with Lymphoma Cancer on Friday 15th February 2019 and started chemotherapy that same day. Her name is Yasmin, 17 years old, a talented cheerleader and skater, always friendly to others, a kindness that you don’t see much of now a day and always been happy to help others when they have needed it. Yasmin has trained to be cheerleading coach and now learning dance at collage, to make a better future for herself. Yasmin has a long hard fight a head of her with a 2-year treatment plan in and out of hospital where sometimes it will be hard and a struggle. Kristianna and Tia will be doing a charity tandem skydive on Sunday 23rd June 2019. to raise over £1000, they would be grateful for any donations you can give, So they ask that for a few minutes today, and do act of kindness for another person, help raise funds for a worthwhile cause to make a young lady happy in her rough times ahead, because Kristianna and Tia wants to give Yasmin things she will need while having treatment. Click on link below to help. The Government made a statement on Brexit, ahead of three days of debate and votes on the UK's withdrawal from the European Union, which are expected on Tuesday, Wednesday and Thursday. On 26 February 2019 the Prime Minister made a statement where she committed to "hold a second meaningful vote by Tuesday 12 March at the latest." As well as holding additional votes on the subsequent two days, if the Prime Minister's withdrawal agreement is defeated in the House, on leaving the European Union without a deal and extending the Article 50 period. In anticipation of these votes, the Government is making a statement on Brexit. So has anything changed? Yes, and no. The statement issued by the UK and the EU (known officially as a joint interpretive instrument ) gives added legal reassurance that both sides intend that the backstop plan for the Irish border, if it ever needs to be used, would be only a temporary measure. In fact, the joint instrument will have the same legal standing as the withdrawal agreement . But it does not replace, over-rule or contradict it. Alongside the joint instrument, two other documents have been agreed: a joint statement that commits both sides to try to develop technological solutions for the Irish border by the end of 2020; and aunilateral UK statement which sets out the government's interpretation of how it could eventually exit the backstop if the EU acts in bad faith. Does the EU want to do a deal after saying this? Austria, Belgium, Czech Republic, Denmark, Estonia, Finland, France,Germany, Greece, Hungary, Iceland, Italy, Latvia, Liechtenstein, Lithuania, Luxembourg, Malta, Netherlands, Norway, Poland, Portugal, Slovakia, Slovenia, Spain, Sweden and Switzerland. All employees have basic rights in the workplace -- including the right to privacy, fair compensation, and freedom from discrimination. ... Those rights include the right to be free from discrimination based on age, gender, race, national origin, or religion during the hiring process. Keo Films, producers of Britain’s Best Home Cook are currently producing the second series of Britain’s Best Home Cook for BBC One. They are looking for passionate and talented home cooks from all over the country who love making delicious food for their friends and family to apply for the show see details on poster below. With the UK on course to leave the European Union in March next year, the country faces four possible scenarios. Brexit is the impending withdrawal of the United Kingdom from the European Union. In a referendum on 23 June 2016, a majority of British voters supported leaving the EU. Guto Bebb was elected Mp May 2010 now quits as minister over Brexit vote. Prime Minister Theresa May wants to keep close ties with the EU in certain areas, such as trade in agricultural products and allowing skilled migrants access to jobs in the UK. She says her plan will allow Britain to take back control of its laws, money and borders, just like people voted for in the 2016 EU referendum, while also allowing as "frictionless" trade as possible and avoiding a physical border for Northern Ireland. But it has been attacked as an unworkable compromise by people from both the Remain and Leave ends of the debate. The EU may also decide to reject it, but the two sides are still hoping to strike some kind of deal by the autumn and, despite criticism and ministerial resignations, Mrs May believes this is the best option. A clean break with the EU. The UK would fall back on its membership of the World Trade Organization (WTO), the global body governing international trade. Those arguing for this option - the so-called "hard Brexiteers" - say it would create a truly independent nation able to strike its own beneficial trade deals around the world. The UK has formally triggered the mechanism to leave the EU at 23:00 GMT on 29 March 2019. To reverse that at this late stage would mean a huge loss of political face, and probably require a new prime minister, with the backing of voters in a general election. The UK government has ruled this out but there have been a number of people calling for a fresh vote but how many would you want? Until you get what you like or what the country first voted for and to leave. With Parliament apparently split over what kind of Brexit it wants, a referendum on the final deal agreed by Theresa May in Brussels might yet end up being the only way to break the deadlock. Those campaigning for another referendum say voters should get the final say. Labour's leadership say a general election should be held rather than another referendum. Parliament needs to start working together to get the best for UK, if it’s a deal or no deal we look weak as country still divided, we need to get on one path, believe and trust we will be better. What does the government White Paper reveal? The government has published its long-awaited Brexit white paper. The document is 104 pages long and follows last week's Chequers agreement which set out the sort of relationship the UK wants with the EU after Brexit. Mr Johnson has written in the Daily Telegraph that the approach agreed at Chequers "means disaster" for Britain. The ex-foreign secretary said the PM's plan would hand the EU "victory". But Mrs May's official spokesman said: "There's no new ideas in this article to respond to." Downing Street said the prime minister's blueprint for future relations with the EU, hammered out with cabinet members at her country residence in July, was deliverable and could win the support of the House of Commons. 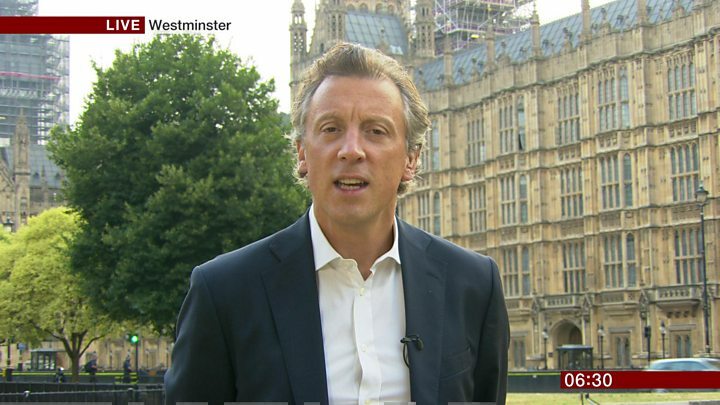 And former home secretary Amber Rudd told the BBC's Politics Live: "Once again, it's a case of leap before you look - there's absolutely no proposal here." Ms Rudd said the Chequers plan represented "the best shot we have of Brexit that's going to work for the UK". Wednesday's inflation figures show that increases in computer games and transport - up 5.6% in the year ending July 2018 - were partially offset by falls in the price of clothing. For manufacturers, the cost of raw materials was 10.9% higher than in July 2017, the biggest rise in more than a year. Much of that cost pressure has been caused by oil price increases of more than 50% over the period. The CPI figure had hit a five-year high of 3.1% in November, when the inflationary effect of the pound's fall following the June 2016 Brexit vote reached its peak. Earlier this month the Bank of England forecast inflation would rise to 2.6% in July before falling back. Tej Parikh, senior economist at the Institute of Directors, said the rise in inflation showed the cost of living squeeze was not yet a thing of the past. "For households this isn't good news, as the already weak growth in their pay packets is being further eroded by high prices. This is likely to weigh down consumer spending, posing fresh problems for embattled high street businesses," he said. "As the temporary factors pushing prices up fade away, inflation is expected to slowly fall back close to the target rate, but that will offer little respite for workers without a significant pickup to their salaries in tandem." Samuel Tombs at Pantheon Macroeconomics added: "Unless inflation in the services sector strengthens dramatically, CPI inflation will fall below the 2% target in the first half of next year." Abdullah Khater also said his family - who are originally from Darfur in Sudan - was in "a state of shock" over the incident. Theresa May and Donald Trump are holding talks at her country retreat Chequers, following his controversial comments on the PM's Brexit plan. In an interview with the Sun, Mr Trump said the PM's plan would "probably kill" any trade deal with the US. 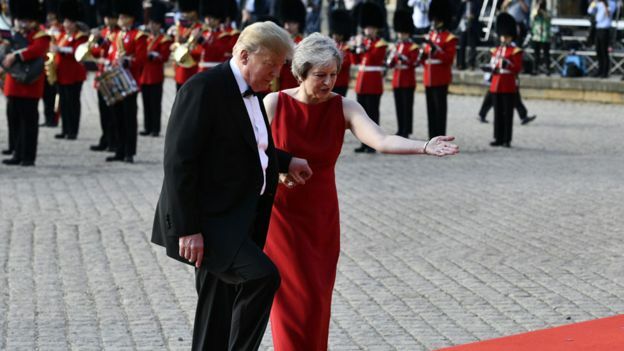 But on Friday, he said he and Mrs May had "probably never developed a better relationship" than during this trip - his first to the UK as president. Meanwhile, a giant blimp of Mr Trump as a baby is floating in central London. It is part of a demonstration in Parliament Square, one of many due to take place across the UK on Friday. In his interview with the Sun, Mr Trump also said that former Foreign Secretary Boris Johnson - who disagrees with the PM on Brexit and resigned this week - would make a "great prime minister", adding "I think he's got what it takes". He also renewed his criticism of London Mayor Sadiq Khan over last year's terror attacks in London, saying he had done "a terrible job". Downing Street has not yet reacted to Mr Trump's remarks, but Chancellor Philip Hammond said the talks will be "very positive". Theresa May has been making the case for a US free trade deal, and says Brexit is an "unprecedented opportunity" to create jobs in the UK and US. The US president and his wife, Melania, were given a red carpet reception at Blenheim Palace, Oxfordshire on Thursday evening. Mr Trump - who has been a long-time supporter of Brexit - told The Sun that the UK's blueprint for its post-Brexit relations with the EU was "a much different deal than the people voted on". He said the Brexit proposals Mrs May and her cabinet thrashed out at the PM's country house Chequers last week "would probably end a major trade relationship with the United States." "We have enough difficulty with the European Union," he said, saying the EU has "not treated the United States fairly on trading". He also said Mrs May had not listened to his advice on how to do a Brexit deal, saying: "I would have done it much differently. "I actually told Theresa May how to do it but she didn't agree, she didn't listen to me. She wanted to go a different route," he said. The BBC's political editor, Laura Kuenssberg, said Mr Trump's interview had "driven a bulldozer" through Mrs May's claim that the UK would be able to get decent trade deals with the wider world, while sticking to the EU rules. 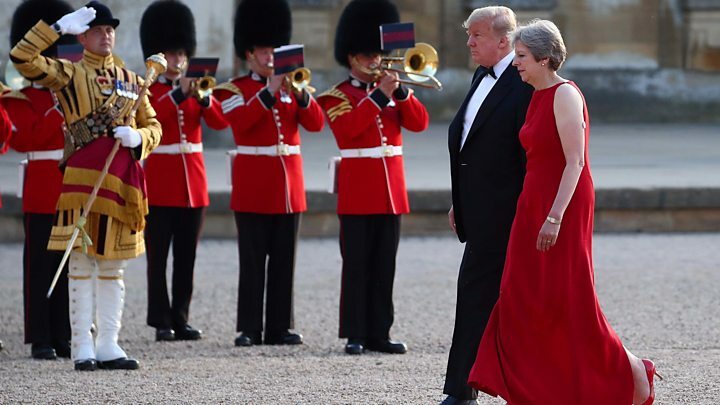 But Foreign Office minister Sir Alan Duncan said things had "moved on" since Mr Trump's interview - which was carried out before he arrived in the UK - and the mood at Thursday night's dinner was "fantastically positive and did focus a lot on trade". The government does not see Mr Trump's behaviour as "rude", said Sir Alan, adding: "Donald Trump is a controversialist. That's his style." 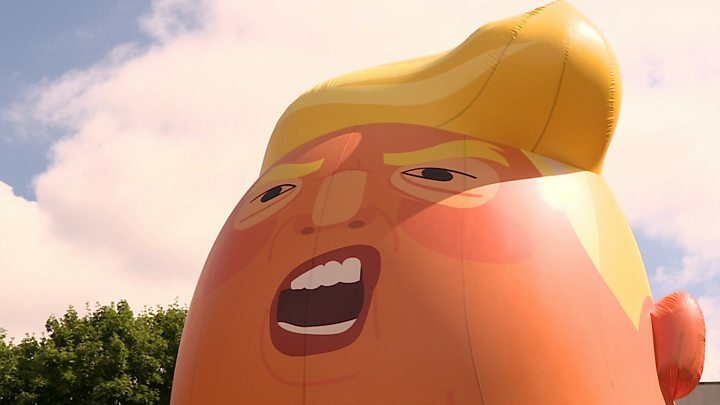 Mayor of London Sadiq Khan defended his decision to allow the giant Trump baby inflatable to fly over London, saying: "The idea that we limit the right to protest because it might cause offence to a foreign leader is a slippery slope". 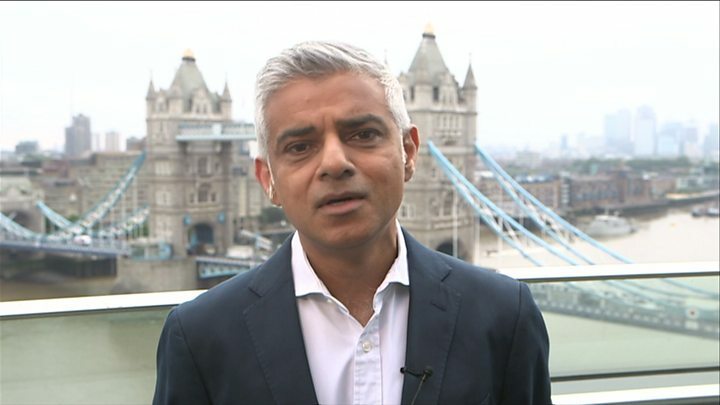 And, responding to Mr Trump's criticism of his response to terrorism, Mr Khan said it was "interesting" that he "is not criticising the mayors of other cities" which have also experienced terror attacks. Mr Trump's comments came on the same day the UK government published its proposal for its long-term relationship with the EU. The plan is aimed at ensuring trade co-operation, with no hard border for Northern Ireland, and global trade deals for the UK. Mrs May said the plan "absolutely delivers on the Brexit we voted for". But after ministers reached an agreement on the plan at Chequers a week ago, leading Brexiteers Boris Johnson and David Davis resigned from the cabinet. Mrs May and Mr Trump are watching a joint counter-terrorism exercise by British and US special forces at a military base. The pair will then travel to Chequers - the PM's country residence in Buckinghamshire - for talks also being attended by Foreign Secretary Jeremy Hunt. 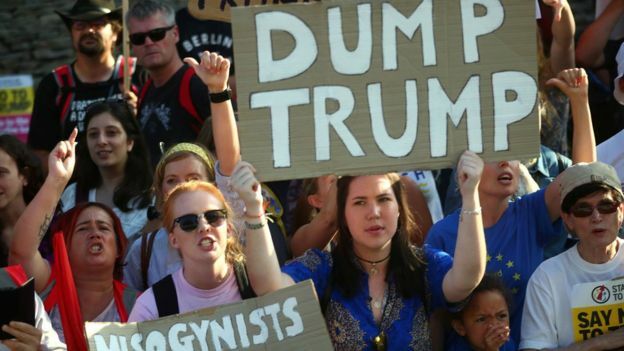 Media captioExtra security is in place to police protests planned for the second day of Mr Trump's visiThe president and first lady will travel to Windsor on Friday afternoon to meet the Queen, before flying to Scotland to spend the weekend at Mr Trump's Turnberry golf resort. This part of the visit is being considered private. England won a World Cup penalty shootout for the first time on a night of high drama in Moscow, overcoming Colombia to secure a quarter-final meeting with Sweden.. The new Data Protection Act 2018 alongside the GDPR. Organisations and data protection professionals could use this as an introduction to the new Act. ICO the data protection authority for the UK, are eager to embrace the changes it brings and begin regulating the new UK and EU legislation that, from 25 May, will make our country one of the world’s most progressive data protection regimes. PSV transport and passenger-carrying vehicles such as buses, coaches and minibuses provide an essential service for today’s commuters and leisure travellers. Operators will always strive to improve the safety of their passengers but despite the enormous strides in modern technology for detecting when a driver is either distracted or fatigued, is enough focus given on some of the route causes in the first place? For some considerable time now drivers have been subjected to monitoring devices such as CCTV, Green Road and RIBUS all of which records various actions and driving behaviours. Additionally now, a new system called FRS, (Facial Recognition System) is being considered.Indeed, some companies have already started to integrate face-detection in the design of driving safety systems. The most popular systems are able to detect driver’s fatigue, distraction, and improper behaviour. These systems consist of modules of head-shoulder detection, face detection, eye detection, eye openness estimation, fusion, drowsiness measure percentage of eyelid closure estimation, and fatigue level classification. They are based on fusion algorithms that estimate the eye state and other regular face status or actions. The driver monitoring system detects fatigue through heavy eyelids, as well as other potential threats, such as driver smoking, speaking with a phone, or not looking at the road. A camera installed on top of the dashboard is continuously measuring his face and behaviour, by observing the direction of the driver’s face and detecting whether his or her eyes close. If the system detects any of these behaviours, an alarm is activated in the bus, combining a noise with a visual sign in a dashboard screen (and the vibration of a motor positioned in the seat?). If the alarm does not go off, a dispatcher in the control room will be alerted to the problem through a backend application. The system also allows the sending of a photo or short digitally recorded CCTV in real time as a proof. Several actions will follow according to each operator procedure, such as calling the driver, recommending him or her a break, taking him off duty, etc. Arguably, employers still need a better understanding of the whole range of issues surrounding their employees and what causes these type of problems in the first place. For example, drivers undertaking longer hours at work to cover the jobs within the difficult shift patterns. Driving whilst suffering with fatigue is extremely dangerous, both for yourself and other road users. Driving requires intense concentration and perception but these are greatly reduced when you are drowsy or tired. Your judgement skills are greatly impaired which can then make reaction speeds to potential dangers almost unavoidable. Working excessive hours is proven to adversely affect ones health not to mention the damaging effect long hours can impact upon precious family time and social relaxation. workload. For example, work that requires constant attention. Complex or monotonous working patterns can increase the risk of fatigue. Driving especially when tired makes you less likely to be fully in control of your vehicle. The law takes a dim view of driving whilst fatigued. If you are caught driving whilst drowsy or you fall asleep at the wheel, you can be charged with careless or dangerous driving. If you are involved in a fatal accident, you could be charged with manslaughter and dangerous driving which could also result in a prison sentence of up to fourteen years. D&G welcomes any new technology that helps improve passenger and driver safety, but this has to be balanced with properly supporting the driver in preventing these things happening in the first place. Technology should never be used to absolve the employer of its responsibilities and duty of care towards its workers. Have a Merry Christmas and be safe if out enjoying this time of year. Theresa May won the backing of Cabinet Brexiteers to double the UK's "divorce bill"
When it comes to the future of transportation, the first thing that comes to mind is the possibility of flying cars. It's easy to imagine an urban utopia with vehicles that float through the air, swerving around buildings, reaching toward the heavens. While Back to the Future: Part II wrongly predicted that we would have this technology in 2015, autonomous vehicles—which are currently being tested—may just be the stepping stone to making this a reality. Who would've thought robot cars would be our present? London cab company Addison Lee is to lead a government-backed effort into driverless car research, launching a UK firm into a field dominated by US tech companies. Addison Lee will lead a consortium including Ford, which has its own autonomous vehicle programme, to explore the potential for unmanned vehicles and ride-sharing services in London. The Merge Greenwich project, backed by funding from the government's Innovate UK, estimates up to a third of London car journeys could be replaced by self-driving vehicles by 2025, taking up 25 per cent of the city's transport market, worth £3.5bn. The project will simulate how driverless cars and ride-sharing can operate in London, focused in Greenwich, and develop a plan over 12-months for a driverless transport pilot in the borough. Addison Lee chief executive Andy Boland told the Telegraph: "Today we will do 30,000 trips in London and all our data and information can be used to simulate demand and supply availability." Mr Boland said he expected some of Addison Lee's services to be autonomous in London within the time frame. "Someone developing autonomous vehicles in California doesn’t mean it will be five years ahead of London soon,", he said, "where we come into it - and Innovate UK's push - is really about propositions for a real-world environment." Ford has been pushing its own efforts into driverless car tech, investing $1bn in Argo AI, an artificial intelligence company which will produce the software needed for a new generation of self-driving cars. Ford will provide the Merge project with its knowledge of creating driverless cars, while Addison Lee will provide data from its commercial fleet. Mr Boland said he believed car manufacturers would "ultimately own and manage the global supply chain" of autonomous vehicles, rather than tech companies. The US car giant has stated it plans to have its own driverless cars on the roads by 2021, as well as licencing its technology to other manufacturers. It recently partnered with ride-sharing company Lyft in a move to accelerate its efforts to deploy driverless cars. Because this technology is so new, is it too soon for them to share the roads with human drivers? Would you trust a robot or computer system with your life? How safe are they, and should we be putting our lives in the hands of robot technology? Theresa May appears to have won the backing of Cabinet Brexiteers to double the UK's "divorce bill" offer from £20bn to £40bn. At a tense two-hour meeting of senior ministers in 10 Downing Street, Boris Johnson and Michael Gove are believed to have agreed to the move - with conditions. As a result, the Prime Minister is now poised to offer £40bn later this week if the rest of the EU is ready to move towards trade talks in December. And in another significant move aimed at breaking the deadlock in Brexit negotiations, the UK will allow a role for the European Court of Justice after Brexit. The moves were agreed at a meeting of the Cabinet's Exit and Trade (Strategy and Negotiations) Cabinet committee, already being called a Brexit "war Cabinet". An early signal that ministers were ready to agree to double the UK's divorce bill offer came from the Brexit Secretary David Davis as he arrived for the meeting. Will Brits will ‘go bananas?’ at £40bn Brexit divorce bill which is ‘playing Santa’ for the EU, top Tories warn as Theresa May meets ministers to thrash out size of payment. Controllers are set to strike in a row over pay sparking fears of widespread disruption across the capital. Transport for London confirm their staff will be on strike on Sunday 27th and Monday 28 August. The strike was voted for by members of the Unite union. The staff responsible for re-routing buses due to major events, roadworks and accidents, bus station controllers, network traffic controllers, revenue protection inspectors, infrastructure controllers and road transport enforcement officers will begin their walk-out at 00:01 on Sunday, with the strike expected to last 48 hours. The members on strike are also responsible for answering emergency code red alarms directly from bus drivers. Drivers can choose how to proceed if they don't receive a response and, if they are uncomfortable continuing their journey, can decide to immediately cancel their service. The action, which was announced whilst 'peace talks' between TfL and Acas broke down, was called over complaints of inadequate pay. "This is entirely the fault of TfL management which has had every opportunity to resolve this dispute long before now." During talks TfL were prepared to improve the workers' pay offer to a non-consolidated payment of £350 for each year, which amounts to £6.73 a week. However the bus staff claim the pay offer is the worst of any sector of TfL workers, adding London Underground workers are to receive a 3.2 per cent increase this year. “We made a revised offer to staff at the conciliation service ACAS on Tuesday in a bid to resolve the dispute. This offer is fair, maintains pay and conditions, brings salaries in line with similar roles and reflects the tough financial environment in which we operate. Discussions have been underway for the past 13 months and we remain open for talks. We are putting plans in place to ensure minimal disruption to bus services over the bank holiday weekend should the strike action go ahead." Bus companies for the planned industrial action at centercom over the weekend, are stating that there were initial fears that bus drivers, Londoner's and visitor's to London may be put in danger with no code red facility. They have been assured by the managers at cetercom, that this is not the case. The code red facility will be fully operational with the normal cover available. More info click on link below. Sadie Nine talking about bus drivers and wheelchair users with Carleton Maflin and Alison. Unison has won a four-year battle against the Government, with the Supreme Court ruling on Thursday 26th July 2017 that employment tribunal fees are unlawful. Ever since the government introduced tribunal fees three years ago, the number of claims has plummeted as workers have been forced to find fees of between £160 and £1,200 before they can pursue a case. Court cases we're unsuccessful as a result it was too easy for some employers to escape justice. Many low-wage workers now must put up with unfair or discriminatory treatment simply because they cannot afford to take a case. Unison we’re determined not to give up the fight as thousands of low-paid workers was pinning their hopes on them being successful. Thursday 26th July 2017 Unison won their case at the Supreme Court, ruling that employment tribunal fees are unlawful. Anyone who has been treated illegally or unfairly at work will no longer have to pay to take their employers to court – as a direct result of UNISON’s legal challenge. The Government will stop charging employment tribunal fees and refund more than £27m to the thousands of people charged for taking claims to tribunals since July 2013, when fees were introduced by then Lord Chancellor Chris Grayling. Well done Unison a great result for all employees. New petrol and diesel cars, manufacturers won't be able to sell new cars with internal combustion engines by this deadline 2040 in the UK. Well, not banned outright, but it means a nation of around 45million licence holders will have little choice but to turn to electric vehicles - an option that's been readily available to drivers for the best part of a decade but has so far proved too expensive and impractical to take off. Yes. The ban is purely for new vehicles being sold. According to Environment Secretary Michael Gove there will be a 10-year phasing out period after 2040 to remove all internal combustion engine cars from the road network. According to recent National Grid report, peak demand for electricity would have to increase by around 50 per cent, from 61 to over 90 gigawatts to cope with the number of EVs being charged, especially after 5pm when many workers arrive home. To cope with demand, it would have to turn to imported electricity, which will rise from around 10 per cent of total electricity used in Britain to around one third. This could have serious issues for energy security. Passport - Terrorists use multiple identities. Do you know someone with documents in different names for no obvious reason? We need members of the public to trust their instincts and pass on information which could help stop terrorists in their tracks. Trust your instincts and call the Anti-Terrorist Hotline on 0800 789 321. A textphone service is available for people with speech or hearing difficulties on 0800 032 45 39 (text messages from mobiles are not accepted). These rates are for the National Living Wage and the National Minimum Wage from 1 October 2016. Workplace burnout isn’t just feeling a bit tired or coping with the stress of everyday work. It’s a feeling of chronic exhaustion, frustration and powerlessness. Those suffering from burnout tend to withdraw emotionally from their work, lose motivation, and become less productive. Studies also link burnout to numerous emotional and physical health problems. What causes burnout? Work overload is often a factor. Because of economic pressures, some employers demand that employees work longer hours, at times for less money. Technology now keeps some in constant contact with their job, blurring the lines between work and private life. For some, job insecurity, lack of control over their work, or feelings of being treated unfairly contribute to burnout. So does dealing with unclear priorities or conflicts with co-workers. Granted, change may seem impossible if you feel trapped in circumstances beyond your control. Nevertheless, consider the following four steps for dealing with burnout. You may have more options than you realize. What is most important to you? Many people would likely put family relationships and good health near the top of their list. These are things that are likely to suffer if you are burned out. By clarifying your priorities, you prepare yourself to make difficult decisions and accept trade-offs. For example, you may see that your work is leading to burnout. Yet you may reason, ‘I cannot change jobs or work less; I need the income!’ True, everyone needs income, but how much and at what cost to the things you value most? Beware of pressure to adopt the priorities of others around you as your own. Your employer’s priorities and yours are likely different. Others may choose to put work first in their life, but this does not mean that you must do the same. To reduce stress and gain time for what you truly value, you may consider working fewer hours, you may be able to persuade your employer to reduce your current job demands, or you may determine that you need to change jobs. Whatever you decide to do, you will likely need to adjust your financial situation and make changes in your lifestyle. But this is not impossible and may not be as hard as you might think. We live in a consumer-oriented society which sends the message that happiness is linked to income level and possessions. But in reality it is not. A simpler lifestyle can bring greater freedom and satisfaction. To prepare for such a change, reduce expenses and save money. Try to lower or eliminate debt. Discuss the need for change with your family members, and seek their support. 3. LEARN WHEN TO SAY NO TO WORK. If you face an unrealistic workload or some other persistent problem in your workplace, discuss your situation with your union and employer. A flexible working time arrangement may become necessary and in certain circumstances you may also be covered by the Equalities Act 2010. Whenever possible, the union will offer solutions that meet both your needs whilst recognising those of your employer. Reassure your employer of your commitment to your work, and explain what you are willing to do; but be clear and firm about what you are not able to do. Even when your work is free of major problems, you may still have your share of stresses, difficult people, and unpleasant situations. So make time for sufficient rest and balanced recreation. Remember that recreation does not have to be expensive to be refreshing to you and your family. Cultivate interests and friendships apart from your work, and avoid defining yourself by the type and amount of work that you do. Why? The book Your Money or Your Life observes: “Who you are is far greater than what you do for money.” If your identity and self-worth come primarily from your work, then you will find it difficult to minimize the role that work plays in your life. Concern is growing amongst many bus drivers, especially in London, about the number of hours they are expected to work and the types of shift pattern leading to fatigue and drowsiness at the wheel. For example you may be contracted to work between 38-43 hours per week but could find yourself actually working in excess of 45 hours per week including break times. Because of ‘spread overs’, some drivers work in excess of 55 hours per week whilst only receiving pay for 40 hours. Then there are the shift patterns. Imagine working a Saturday night shift that actually finishes at approx 2am on a Sunday morning, only then to be told that your next shift will commence at 5am the very next day! How is that truly putting the safety of both the driver and that of his or her passengers first? Would you feel safe getting on the bus with your family knowing that the driver is working to that type of pattern? During induction training, a driver will be told on how many hours he or she can drive and that by law you must have 8.5 hours between duties. (This includes driving home and to work, washing, eating and having a sleep.) However, you are not necessarily made aware about the type of roster patterns that may have a detrimental impact on your health. Transport for London has said that driver hours are strictly governed by the European Community (EC) regulation (561/2006) as well as rules under the UK’s Transport Act 1968 (as amended by the Drivers Hours (Passenger Vehicles) Order (SI 1971 No818). They say that these highly prescriptive regulations set out the time allowed for layovers and rest periods – and that if a driver feels that their shift pattern is not compliant with these, they should raise their concerns with their employing company. This highlights the need for us as drivers to stand together and not let the bus operators continue with unsafe rota patterns. Driver’s hours also need to be overhauled so that people’s lives are not put at risk.